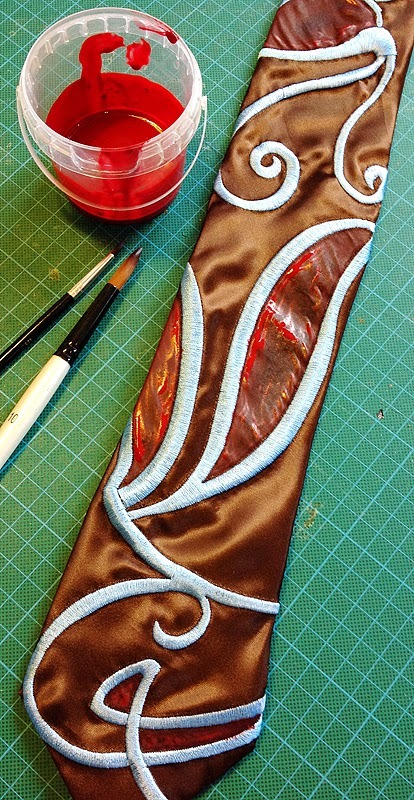 My plans to make a perfect copy of the Eleventh Hour Christian Lacroix tie have been going well. So well I now have a handful of finished ties. I was kind of expecting something to go wrong along the way, but all has gone to plan, which is reassuring. The last thing I need to do is add some special colour to finish them off. 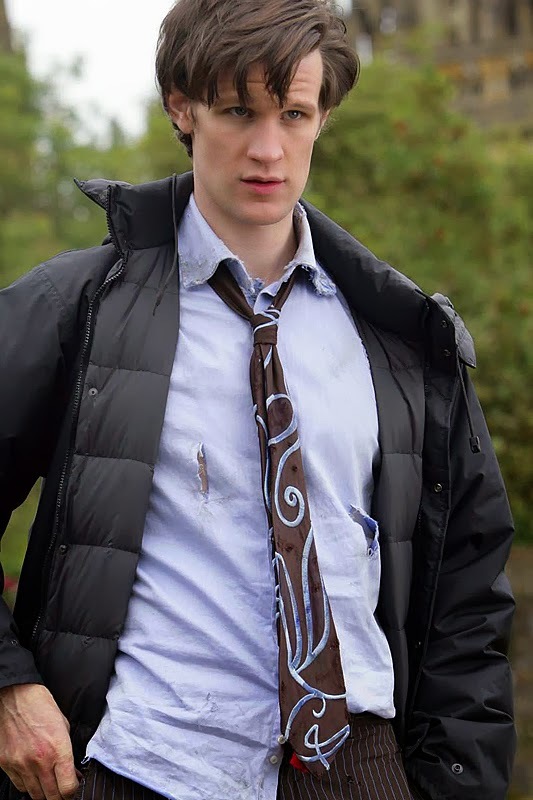 When the tie first appeared there was a lot of debate and speculation about the colouring of the tie. 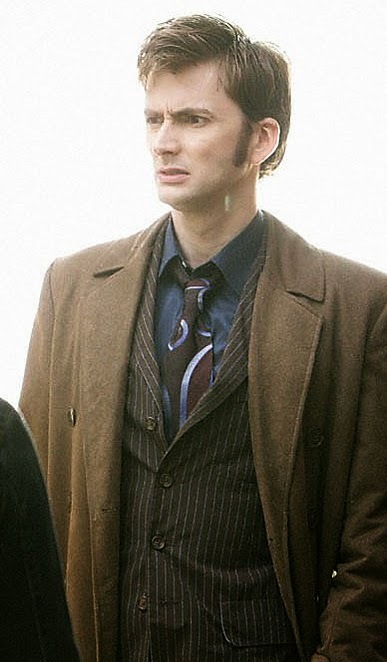 The blue swirly design has areas of enclosed shapes, which look red, but not quite the same as the tie worn by David Tennant. As we now know, it wasn’t the same tie, hence the differences between them. 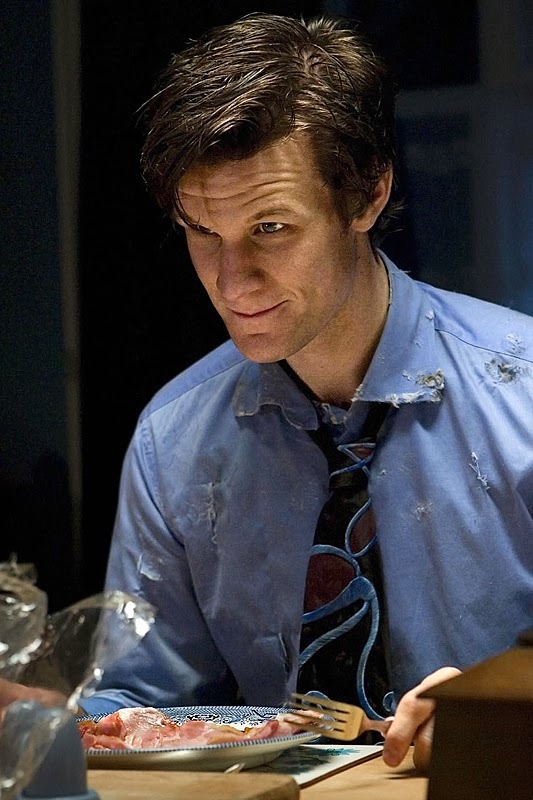 But if you look very closely during The Eleventh Hour, three are inconsistencies even within the episode. This is because there are multiple copies of the tie used. If you look at the location scenes, there are no red sections to the tie. These scenes would have been shot first, so it is possible the red areas were not yet painted. The blue highlights are present. But if you look at the studio scenes, the red patches are very prominent. The placement of the blue swirly pattern is also notably different. If you look at the section below the knot (with the two red patches) the location used tie has this moved over to the right. 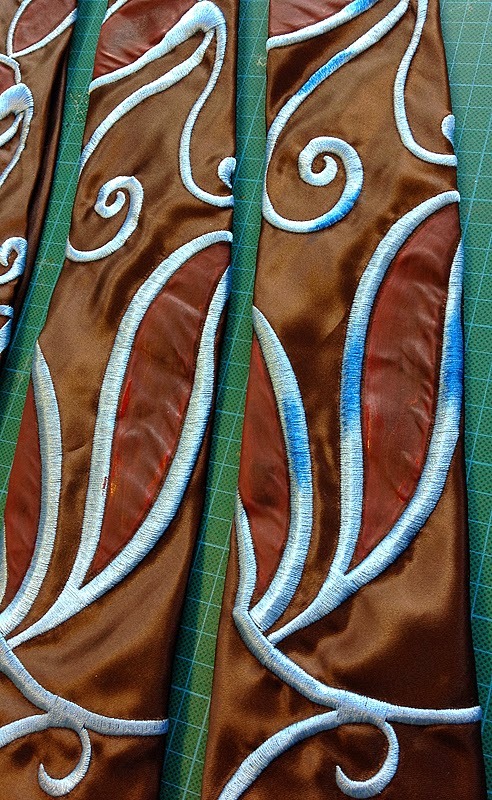 When I saw the real tie close-up I found the red patches of colour were actually just simply painted on. 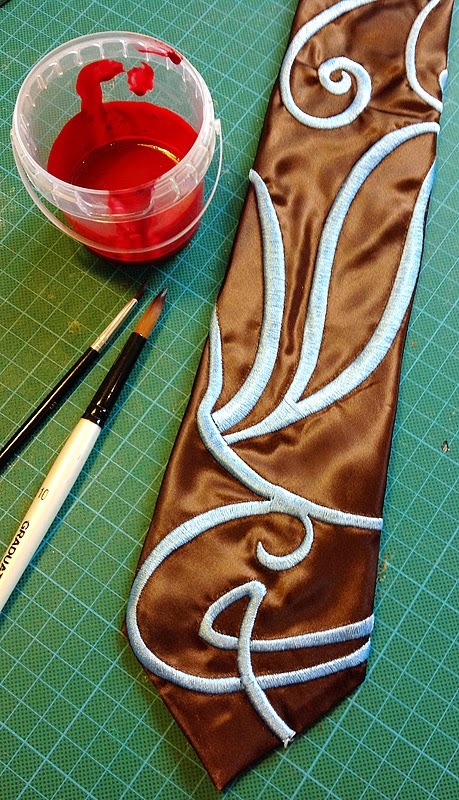 There were also some dark blue highlights on the embroidery. I needed to match these to make the ties complete. 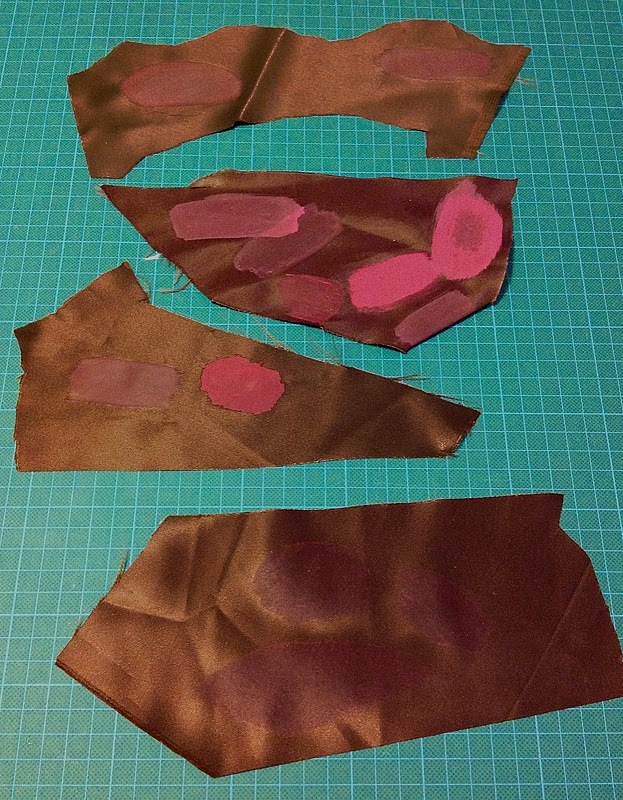 I’ve kept some off-cuts of the brown silk which I can use to swatch test the red paints on. There are a number of fabric paint suppliers on the market, and before committing to which to use I went through quite a few. Some are transparent paints, for painting on light colour fabrics; others more opaque for use on darker colours. I found the latter to be too dominant, so a blend of the two produced a result I liked. Now I’ve got a good mix of red I can begin painting. This is all a bit out of my comfort box, so I just have to trust that the paint will take and settle down to an even coverage. When the paint is first applied it looks a lot brighter and blotchier than it ends up. A second light coat evens out any remaining inconsistencies. Finally I need to add the blue highlights. Comparing the photos I took of the screen-used ties to my Lacroix, I realise the highlights are in corresponding places, so I use my tie as a guide as to where to put them. I need a very dry brush and to just lightly rub the paint on. You can see the before and after here. If you’re coming to Gallifrey One this week, look out for me wearing it! Well I've got to hand it to you, that's an outstanding result. Don't suppose you'd be open to selling any of the other dozen would you? 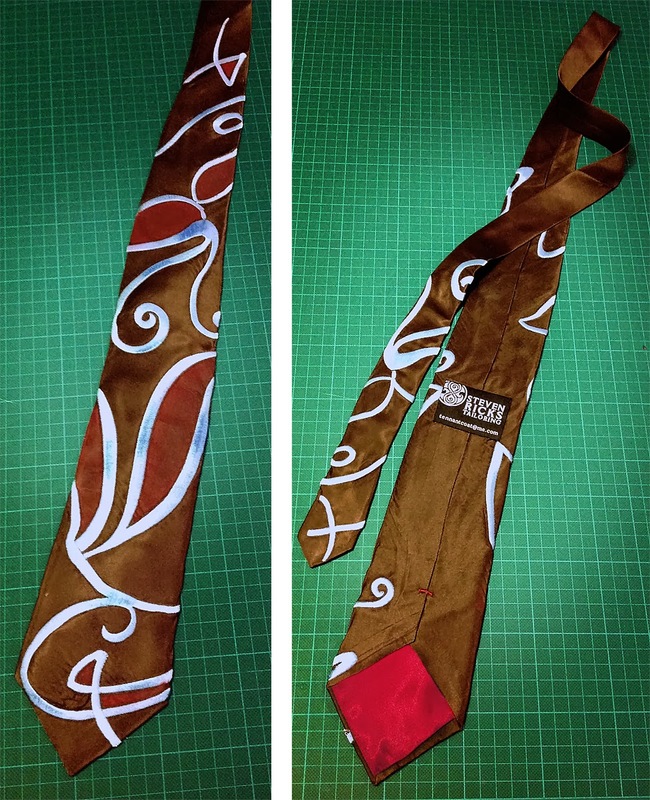 I was a bit worried when you started to paint directly onto the tie, but the results look rather professional. I had no idea you were making ties. It looks amazing.